Digicame-info reports that Olympus will release a 12mm f/2 lens for Micro Four Thirds in June. The production has already started last month in the Tatsuno plant in Japan. Olympus showed a concept mock-up of a M.ZUIKO DIGITAL lens at the CP+ show in Japan but it is not clear if this will be the design for the upcoming 12mm f/2 lens. 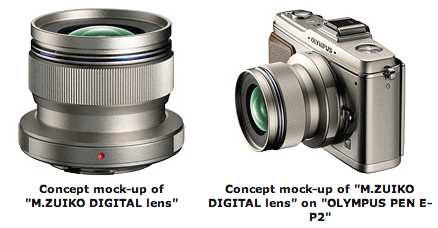 Olympus already has a 17mm f/2.8 M.Zuiko Digital lens for Micro Four Thirds.